"My dad was a NASA engineer who designed the instrumentation aboard the Apollo rockets during the 1960s. He successfully founded a small tech business when he was in his 50s. He transmitted his ingenuity and love of science and engineering to me which inspired me to work as a science teacher for the last 25 years. I am continually amazed by the discoveries children make when they are interested and engaged in their learning. Youth Engineering and Science is a way to make what I imagine happen." "I have always loved trying to figure out how stuff works. As a kid I liked to take things apart. This interest developed into a love of science, and a desire to share that excitement with others. I have spent the past 25 years doing just that, teaching science in schools, camps, Bartram’s Garden, and the Peace Corps. The children I have had the privilege to work with through Youth Engineering and Science, Inc. are eager to learn and are wonderfully creative problem solvers. "I recently graduated with a Master's in Secondary Education from Saint Joseph's University and want to share my passion for science with as many people as possible. 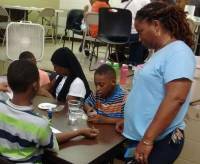 I got involved with Youth, Engineering and Science because it provides students in urban, high-risk settings with exciting experiments that show them that science really can be fun. these students might not have the best experiences with science class during the school year, but being able to see the excitement on the students' faces every day meant so much to me throughout the program. I like to make science as relatable to my students' lives as possible and Youth Engineering and Science definitely provided that." "Filmmaking has been a passion of mine for over a decade. Filmmaking can be a gateway to several different fields. My experience as a filmmaker has introduced me to people and situations I might never have encountered otherwise. I have shot videos involving drag queens, a giant papier mache crab monster, musicians and am currently working on a feature length documentary about the Black Lives Matter protests. Filmmaking is a powerful medium that can relate to sensitive topics and create an impactful change in our collective awareness. I’m looking forward to sharing my knowledge and experiences with a younger generation." "First of all, I love working with young people. My entire life has been about mentorship. As a high school Math teacher, I tried to find unusual and creative ways to teach math to help my students learn. 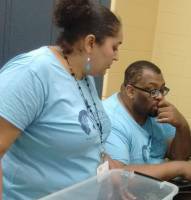 What a great opportunity to combine Math, Science and the use of hands to mentor young people as they instruct younger followers through the YES Summer Program." "I am a math teacher at a (sub)urban high school outside of Philadelphia. I have a passion for making education more equitable and helping all students find success in the ever elusive Algebra I. As a math teacher, I do not always get to show students how all of the equations and formulas apply to their realities. Youth Engineering and Science is giving me that opportunity. I love that Kathy has created a program that brings science to life! I have always been interested in physics and engineering. I am excited to learn new things along with our young scientists!" ​Rochelle R. Peterson-Ansari is a training specialist, coach and consultant for educational, other non-profit and corporate organizations in culturally competent administration, program development, instructional design, teaching, leadership, youth development, mentoring and strategic diversity planning. She facilitates national and regional training programs for premier national civil rights, human relations, and grant making organizations. And, Ms. Peterson-Ansari teaches teachers, youth workers, and first year students at Arcadia and Eastern Universities. Prior to consulting and training full time, Rochelle worked as an administrator in colleges and universities since 1988. She holds a B.A in Sociology from Bucknell University and a M.Ed. in Educational Studies from the University of Vermont. Her purpose is to help others achieve their potential for greatness! "Working with Youth Engineering and Science combines my training in engineering and mathematics education with my passion for igniting the curiosity necessary for students to be competitive in the training necessary for STEM based careers. While earning degrees in both electrical engineering technology and electrical engineering from Temple University, I held the position of PCI (Pre-College Initiatives) co-chair where I assisted with the design and support of programs that exposed local high school students to topics in engineering. As a mathematics educator, I've taught a full range of high school courses including courses in AP statistics and engineering design." "Growing up, we always had buckets of Legos lying around. I loved building things and taking them apart again. It was always my goal to maximize their efficiency and ensure that they were structurally sound. I took this interest to college, where I studied mathematics and taught Engineering and Mathematics Summer Camps through the MESA and TUteach programs. It is always my privilege to work with students who share my interests and passions for engineering and mathematics." 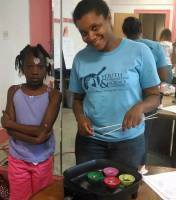 "I love teaching science and wanted the experience of working with underserved children after teaching in a private school for 10 years. 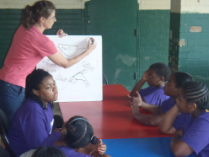 The experience this summer helped me realize that the hands on nature of science in this program was able to connect me to the students, despite our different backgrounds. This hands on connection also allowed the students to experience themselves as scientists and engineers and perhaps more importantly, as learners."